Mitred Binding Corners - AT LAST! 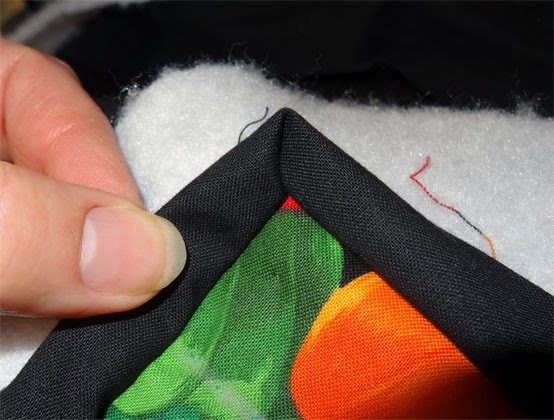 Ever since I started quilting, I've struggled with binding corners. Mine just never seem to lay nice and tidy - instead I get a scrunchy-bunchy, puckery mess that has never really satisfied me. I've looked at books, videos and so on trying to figure out what I was doing wrong. I've had experienced people show me - but no, something always eluded me. I thought I was doing exactly what I was seeing - but no, still that puckery look. BLEH! 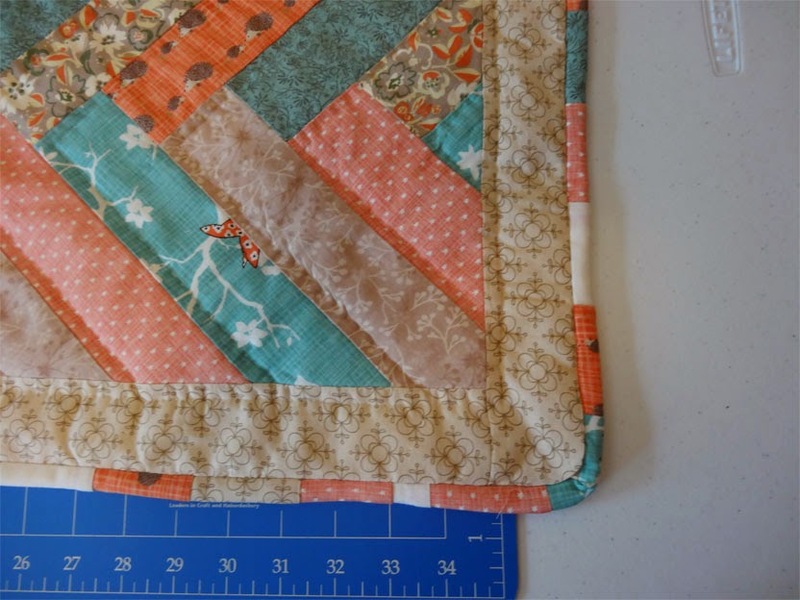 It's always bugged me, but after seeing the gorgeous, tight, smoothly mitred corners on quilts at the Australasian Quilt Convention a couple of weeks ago, well, I just HAD to find a way to do better. And I did, thanks to Aunt Sheila. Sheila is a sweetie and always remembers my birthday (which was a couple of weeks ago) - sending a package of goodies every year. This year's goodie box included a book on Quilting - "The Big Book of Quilts and Quilting". And guess what - I looked at this book's pages on binding, and their explanation of mitred corners and.... YEAH! Hey! I see it! Suddenly it makes sense. Why this author's explanation made sense and none of the others were clear, I can't explain. Maybe I was just finally really ready to learn. Today I finished the quilting on my "Tutti Fruity Throw" quilt (Quilt 19) and quickly slapped together the binding. It took a couple of tries, figuring out the exact point where the turn needs to be, and remembering to put a little slack in, but yeah - finally looks like I've got a binding which won't embarrass me! See??? Nice and tidy. Crisp and clean. A MIRACLE!!! If there's some technique you want to master, and the sources of information you've gone to haven't "clicked", don't give up. Just keep looking at other sources. Eventually you will, like me, get there. One week ago today I attended the Australasian Quilt Convention in Melbourne. I've been aware of this annual event for a couple of years, but somehow managed to miss it each time. This year, however, was different. I made a point of going. I wouldn't have missed it for the world. 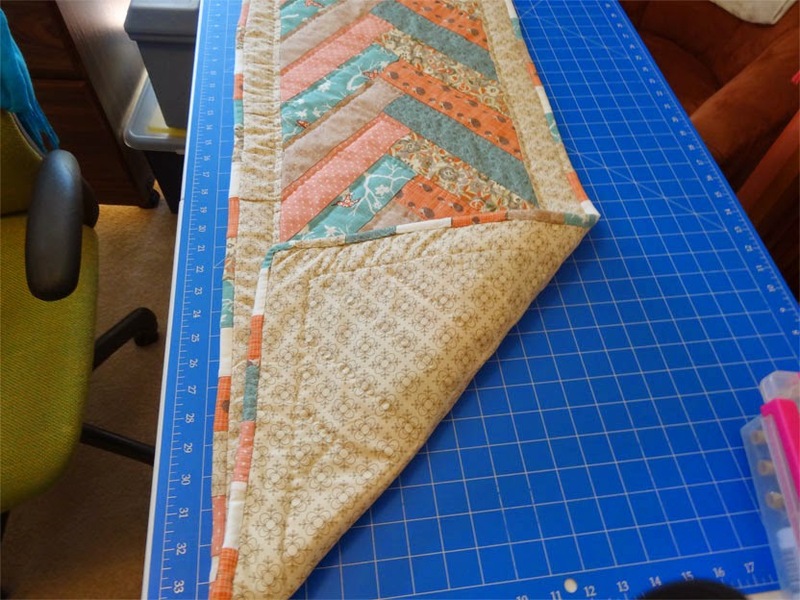 That's because earlier this year I decided the time has come for me to dive into the "deep end of the pool" and get a longarm quilting machine. Longarms aren't exactly as scarce as hen's teeth, but you won't find one at Spotlight or most other places that sell sewing machines. No, they are something of a specialty item. I searched and searched online for dealers - found a couple of them here in Melbourne, but that's about all. I was sure there are dealers, if I could just find them. And, well, here comes the AQC, just in time! I knew that there would be a few manufacturers there demonstrating their systems - how perfect! So I went. I found several different manufacturers represented: Grace, Nolting, Bernina, Gammill, Juki, and Handi Quilter. I visited them all and "test drove" all the different models. 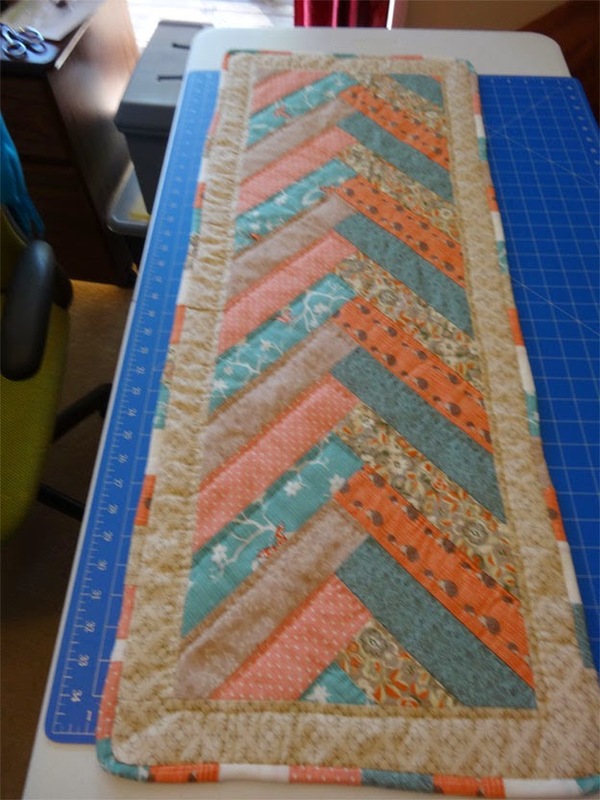 Before going, I watched hours of YouTube vidoes on longarm quilting, so I had at least a bit of an idea of what is involved, and had a baseline understanding of the components. There's a local dealer - one not far from my suburb, actually - and several dealers around Melbourne. This is good from the standpoint of possible maintenance/repair assistance. If I get into trouble, there are different dealers I can turn to for assistance. Not that I expect trouble - but if I have problems, much better to be able to get help via a local call, rather than trying to arrange for support from, say, Singapore. variable frame size. All the systems I looked had had 10-12' frames, except for Gammill, which was displayed with a 6' (or maybe 8? - I didn't actually measure it) and a 12'. Well - I want the capacity for 12' (needed for king-sized bedspreads), but most of my projects in future are likely to be a lot smaller. Handi Quilter's frame poles are in 4' segments (and you can buy a 2' extension), so you can have 8', 10', and 12'. I don't want a 12' frame - about the only place that will fit in my house is the loungeroom. An 8' frame will fit in my spare bedroom (if I take the bed out, of course). In all honesty, I'm VERY surprised the other manufacturers don't offer flexible frame sizes. I liked the control panel and buttons. So, you ask, what's up with that? Well - the buttons and controls are marked well, are somewhat intuitive. Other models I saw that day had pretty strange markings (in some cases, control buttons not labeled at all...?). One model was hilarious in that when the control screen said "off" - that meant the machine was ready to sew, and when it said "ready", that meant the sewing function was switched off. No - I'm not making this up, folks. 5 year warranty. The other manufacturers were offering 2-3 year warranties. I liked the feel of the machine - very smooth, easy to maneuver. No noticeable vibration, quiet. I liked the look of the machine. OK. This is silly, but true. Several of the other machines there looked very "cold" and impersonal. Grey metal, angular, industrial. The Handi Quilter's case is a nice clean-looking white with soft edges. Yes. I know it's silly. The price was moderate - at least as these things go. Grace had the least expensive model, selling for just under $10,000 (with the "special discount" for buying at the convention). But over the years, I've learned that it's better to pay more for tools. I'd gone into the convention with a price in mind, and the Handi Quilter was just a bit below what I'd expected to be paying. Computer upgrade option. I'm not prepared to spend the extra money right now for the computerized version of the machine I'm getting - but the option is there and I can add it later if I want it. Nice! The computerized functions really are magic - but I don't want to spend that money until I am sure that I'll be using the machine enough to make it worthwhile. Price again - the manufacturer dealer offered me a "lightly used" system at a significant discount. As it turned out, the week before the quilting convention, Handi Quilt had a quilters' seminar in New South Wales - and as part of that they had new machines set up for the students to use. The seminar was only 2 days - and the machines would have been lightly used. So - I was offered the chance to buy one of those "out of the box" systems at a significant discount (like... $4,000 off!). Well, that works for me. Lowers the price and also some-what guarantees that the machine has been used and found to be "in perfect working condition". Gadgets. The Handi Quilter booth had lots of little extra "gadgets" on display. Things like a tool tray which lays on top of the support frame, casters for the frame - allowing you to shift it easily, other bits and pieces. Maybe I'll want those gadgets and maybe I won't - but it all just gave me the impression that they were pitching to experienced longarm quilters. They were showing more than the machines and frames; they seemed to have their act together. So there you go. I've put down a deposit, a machine has been reserved for me, and the local dealer tells me I'll have it in early May. Perfect. Now to piece together some projects to use as "learning projects". And, of course, I'll need to get that guest bedroom cleared out. The turquiose-with-flowers print is lovely - AND the flowers are Australian native plants, making it an even better souvenir! We bought the fabric without being completely sure of the dimensions Kathy would want for this one. Worrying that I'd come up short, I had them buy a smidge more yardage than I really thought I'd need. As it turns out, though, I've used nearly every scrap. The binding will be done in the same deep green/gold as the border/edging, and there's enough of the tan/gold (used to in the block "frames") for the backing. The finished runner is meant to be 63" x 16". I mentioned Kathy and Katherine's visit to Australia last week. When they were here, Kathy admired a small table runner I'd made. I offered to make one for them - it would make fun projects for me, and a one-of-a-kind souvenir for them. So off we went to my favorite quilt supply store. It didn't take long for them to find prints to make a runner for their dining room table. As we stood at the cutting counter, Kathy spotted a bundle of prints with peach and turquiose prints in it. She was clearly in love, and the bundle was inexpensive, so on the spot I suggested she buy it and I'd come up with something. I'm laughing just a bit - because at the time I thought it was a bundy of fat quarters. It wasn't. It was "fat eighths". Fortunately, she only wanted a small runner - 38" x 15", so although I did have to go back and pick up a little more fabric, I was able to make it work. Oh, my. I thought it would come together easily. It didn't. Getting the points to line up in the center turned out to be a LOT harder than I expected. I'm very pleased with how it turned out. Like all of my pieces to-date, the top was pieced by machine and then hand quilted. For the binding, went back to the fabric store to see if I could find one of the prints on a bolt. But the store didn't have any of those prints! EEK! 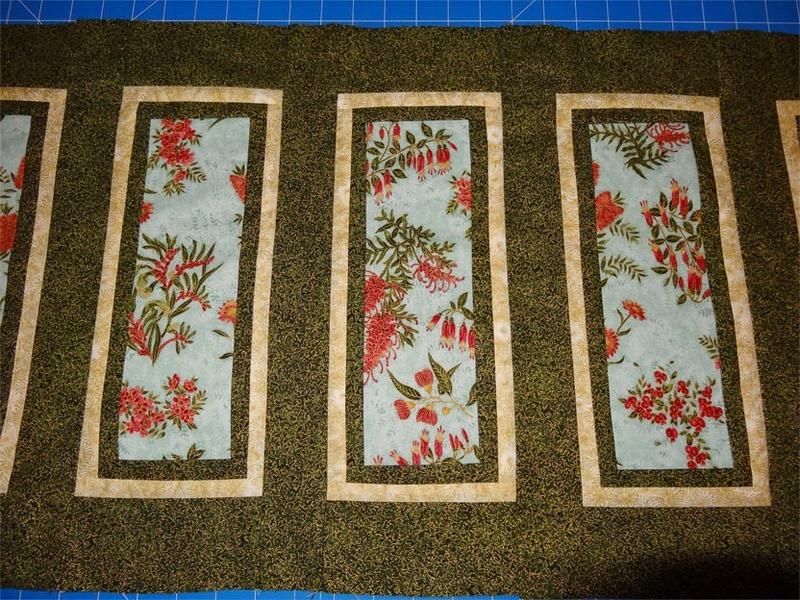 The fabric for the edging (and backing) could have been used as binding, but I felt it would be too bland. Instead, I grabbed the off-cuts and pieced them into strips, making the binding from that. As you can see - it worked our really well! Uh... where did 2014 go? I'm still here, still quilting. Just not blogging. But I've got some finished projects to share and a few in-progress, so here we go, let's see if I can get back in the groove. At the moment, I'm getting some photos together to post here, will get those set up and post them, starting next week. There's bedspreads, table runners, and a couple of "throw" size quilts. In the meantime, I've got a story to tell you. Back in August 2013, I put up a series of posts about "Rob" - a self-taught quilt artist in Colorado. Rob is the next-door neighbor of my good friends Kathy and Katherine, and I met him when hubby and I visited them that year. Rob was very kind, showed me some of his amazing quilts and gave me permission to share my photos with you. And oh, what an gifted quilter he is. An amazing eye for colour and design - and what gorgeous pieces of art he's created. Honestly, it's the most gorgeous quilt I've ever seen. Little 1" blocks meticulously hand-pieces and hand quilted. And the arrangement of the coloured prints - not random. No. They are very deliberately arranged. 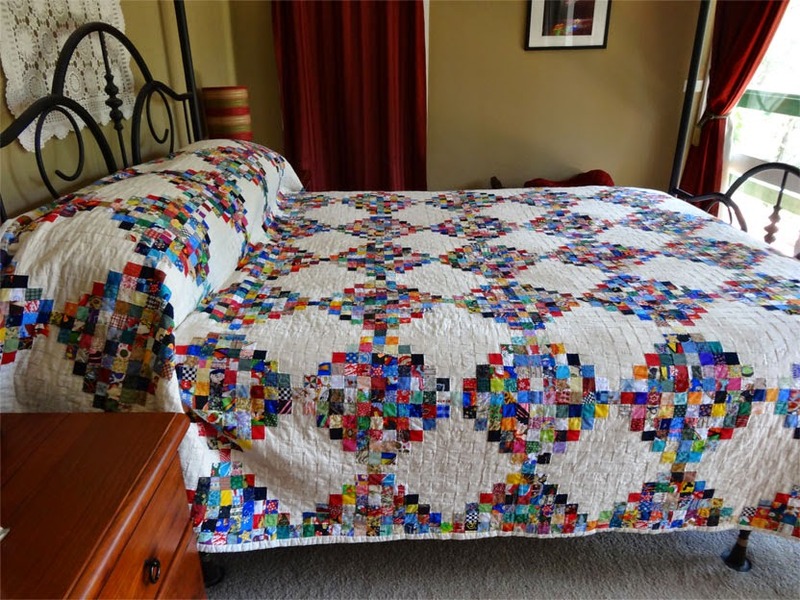 Ever since I saw this quilt back in 2013, I've thought how much I'd like to make one like it. But, honestly, the idea of all those little blocks is intimidating. Yes, it's just little squares sewn together. Sure. But look closely. Folks, it's not a simple quilt at all. Rob's piecing isn't random. Have a look at the closeup below. 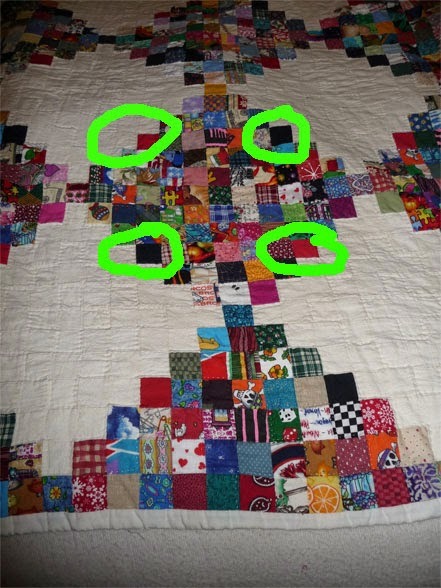 I've circled 4 blocks in particular to show you. Notice there's 2 red ones, 2 black ones, diagonally from each other. Now look again at the photo of the full bedspread above. Each and every diamond on the quilt has the solid red and solid black blocks in exactly the same position. HOW THE HECK DID HE DO THAT!?!??! It astounds me. I can't imagine the concentration and attention to detail required to get those solid blocks positioned so precisely. And those red and black squares are the only solid blocks (other than, obviously, the cream ones). And the prints he used - oh, what charming pieces. When you look closely, you notice that there are halloween prints, Christmas prints, Valentine hearts, and so on, almost an homage to American holidays. And, of course (as you can see from the first photo above), the overall effect is like stained-glass. It's brilliant. Simply brilliant, partly because of it's deceptive simplicity. Simple? Only if you don't really look closely. And the more I study it, the more astounded I am. Well - Kathy and Katherine visited us here in Australia back last January. They brought all kinds of goodies from the US for me - my favorite soap, hair dye (a L'Oreal colour which, for some reason, isn't available here), and other treasures. The big moment came when Katherine brought in her duffle bag, unzipped it, and THERE WAS THAT QUILT!!!! Yes - the quilt you see in the photo above. Recognize the bedroom? It's my bedroom here in Australia. Yes, folks, as astounding as it is, Rob sent that quilt to me. Kathy and Katherine said Rob simply wanted me to have it. He knew I fell in love with it and, well, there you are. It's been almost 3 months, and I still can't walk by this quilt without stopping to marvel at the artistry, and at the generosity of the man who made created it.